Introducing the Freewing Mirage V2 “Tiger Meet”! This incredibly popular 80mm EDF has been updated to “Version 2” for 2018 and now features digital metal gear servos, a vibrant “Tiger Meet” livery for enhanced visibility, and our wildly popular power system including a 9 blade dynamically balanced EDF, 1900kv outrunner motor, and 100A ESC! All of these upgrades make the Mirage V2 more precise, faster, more fun to fly, and most importantly, more easy to see! The Dassault Mirage 2000 is a French multirole, single-engine fourth-generation jet fighter manufactured by Dassault Aviation. 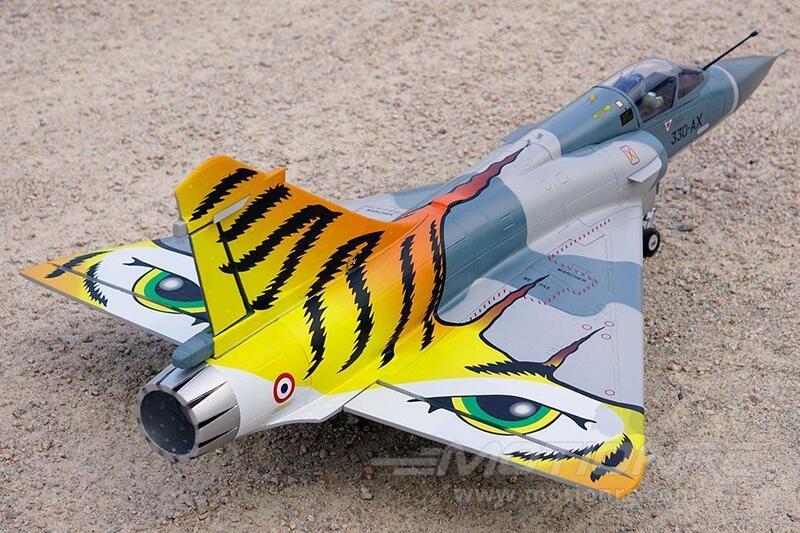 It was designed in the late 1970s as a lightweight fighter based on the Mirage III for the French Air Force (Arme de l'Air). The Mirage 2000 evolved into a multirole aircraft with several variants developed. Over 600 aircraft were built and it has been in service with nine nations. As you've come to expect from Freewing Model, the Mirage 2000 is loaded with scale features and performance componentry. The 9 blade power system provides enough static thrust to maintain a hover, with the aircraft’s nose pointed perpendicular to the ground! Hone your piloting skills to bring this aircraft to a standstill in the sky, then power out for a blistering fast pass down the runway! In the landing pattern, this delta winged wonder slows down remarkably well for nose-high landings.